Assuming you produced your manuscript with Microsoft Word, you already should have used Word’s spelling and grammar checker. You might think this step has been covered – right? Wrong! It’ll probably still be full of mistakes. Here are the steps my wife and I go through before we send a file to a publisher. Read the book through. Either print it out and read the printed copy, or send the file to an e-book reader and read it that way. (More on this later.) Reading it on your word processor isn’t the best solution. After all – any mistakes were made on that. Make corrections on a copy of the document and save it with a different filename so you can revert to an earlier version if necessary. Keep a backup of your book on something else such as a USB memory stick. Trust me, sooner or later, you will have a computer disaster. You don’t want to lose your hard work. If you’re paranoid keep a copy in a different building or ‘in the cloud’. Unnecessary words? “She gave a loud shriek.” Quiet shriek anyone? Grammarly (https://www.grammarly.com/grammar-check). It’s a subscription service. Ginger (www.gingersoftware.com). Needs a slightly more powerful computer. Also a subscription service. 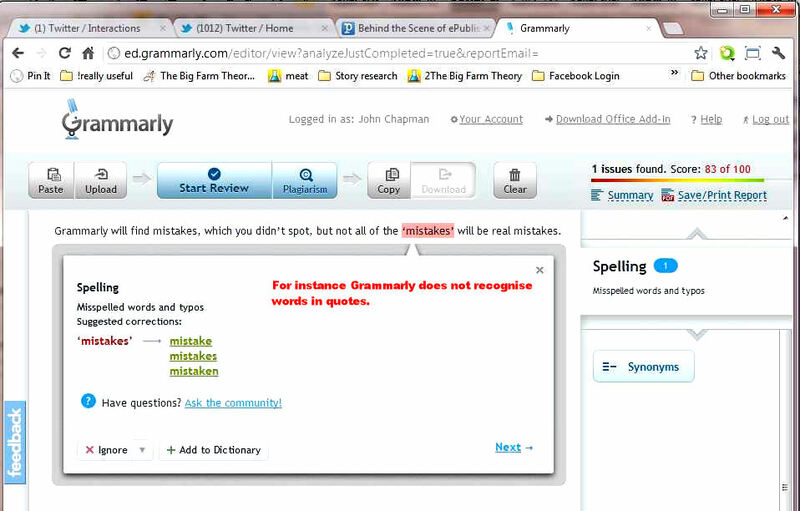 Both Grammarly and Ginger will find mistakes, which you didn’t spot. Not all of these ‘mistakes’ will be errors just as the grammar checker in Word also finds false errors. I find it’s best to put no more than one chapter at a time through it. Grammarly allows you to set your writing style. Ginger is better at punctuation. Get a text to speech program to read the book aloud while you follow along. We use ‘Text Aloud’ which has a plugin for Microsoft Word, but there are lots of other programs including some free options. This step is essential since when reading it yourself, you read what you expect the document to say rather than what is actually there. Addition 2014 – the text to speech option of Word 2013 is very good now and even better on Windows 8.1. Get a proofreader to read the document. You can use a professional proofreader or a friend or do a swap with another indie author. Consider using a proof reader on the other side of the ocean at this stage to find those words and expressions which don’t quite have the same meaning. e.g. Midgie – midget or small candy in the US. Midgie – small biting fly, especially in Scotland. If you have an e-book reader such as the Kindle Touch, Kindle Fire or Kindle Keyboard it will do a fairly good job of reading the text to you. The basic Kindle and Kindle Paperwhite do not offer this feature. At this stage, it’s enough to send the file as a .doc or .docx file attachment to your Kindle e-mail address. Use File > ‘Save and send’. Enter the email address provided with your Kindle. If you don’t know it you can find it from the Home screen menu > Settings > Send to Kindle email (You might have to go to a second screen). A subject isn’t important, but give it the document title + ‘draft’. Once you’ve sent the email it might take a few minutes to show up on your Kindle. Consult your Kindle guide for how to have the document read to you. Expect it to make some terrible pronunciation mistakes though. It will be enough, however, to draw your attention to errors. Although there is a Kindle reader available for these devices, it does not offer ‘Text to Speech.’ To get round that use an e-reader which offers to read the text to you. One such e-reader is Moon+ Reader Pro which is available from the Google Play Store for £3.10 ($4.99). This reader accepts DRM free .epub files. That means you will have to convert your Word file into an .epub file first. I use Calibre to do this. Use the ‘Convert books’ icon to convert the file to an epub format – this is probably the default format. You don’t need to add a cover or meta data unless you want to at this stage. Attach your Android reading device and download the e-book you just created from the Calibre Library. Think you’ve got your book ‘perfect’? Even after going through this process you are still likely to have made or overlooked errors. Professionally printed books contain them. Take consolation in the fact that errors can be corrected in a print-on-demand book or e-book far easier than in a conventionally published book. 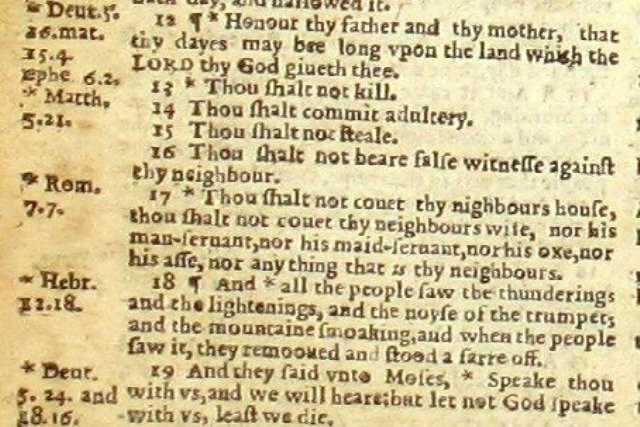 You are also unlikely to suffer the fate of the printer who accidentally missed out a crucial ‘not’, producing the ‘wicked bible’. As a result, he was heavily fined and lost his licence to print. When you’re satisfied with your document, save it again as your master copy. You are now ready for the next step – formatting.